Paymex are a company that is conscious of their indirect costs and had previously managed these internally despite not having an in-house purchasing department. 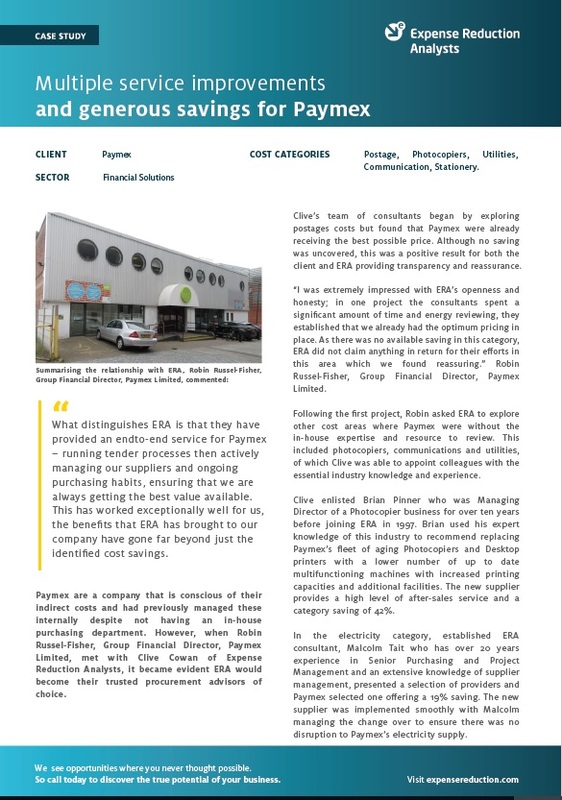 However, when Robin Russel-Fisher, Group Financial Director, Paymex Limited, met with Clive Cowan of Expense Reduction Analysts, it became evident ERA would become their trusted procurement advisors of choice. Clive’s team of consultants began by exploring postages costs but found that Paymex were already receiving the best possible price. Although no saving was uncovered, this was a positive result for both the client and ERA providing transparency and reassurance. To find out more about how ERA helped Paymex, including results, savings and more details from the client, download the full case study now.